The market town of Haverhill hosts a large number of stalls on Market Square on Friday and the High Street on Saturdays. Here, you can browse stalls offering everything from fresh produce to children’s items and even flooring. Tom Chambers has been a market trader for 24 years, and is now in his 15th year of running the Village Foods van at Haverhill Market. 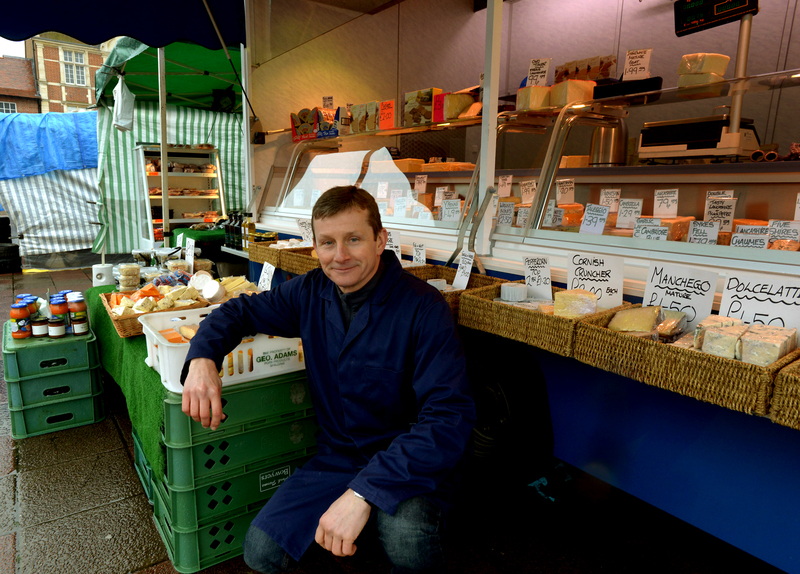 He sells more than 40 different cheeses including Suffolk Gold as well as meat and other delicatessen products. Munroe’s Fish has been trading for more than 20 years, with many regular customers. There is a range of fish on offer, plus most types available to order, filleted and prepared how you like it. At Paul Firman’s Quality Fruit and Veg, on Haverhill Market for more than 25 years, you can also get tips on preparing and cooking them. Haverhill based brothers Brett and Brad Butler run BB Flooring, which offers good quality flooring at low prices. You can chose from carpet, laminate flooring and vinyl tiles and get advice on fitting, sizes and types of flooring. The strategic positioning of Haverhill by the Stour, and near the main crossing point at Wixoe, would have made it an important gathering place for traders and merchants of all kinds in days gone by. All manner of produce would have been traded, from livestock to feed and cloth. Many things may have changed but the warmth of the welcome and the diversity of the products sold remains the same. The Market Square is an ideal place for events and activities. Following on from the success of our first Craft and Gift Fair we have another on Saturday 20th June and again on Saturday 15th August between 9am – 3pm. Over 15 stalls selling cakes, bags, baby clothes, gifts and toys. Our popular motor show is being held on Saturday 11th July and will see a selection of cars and scooters which will provide a great display. NEW for 2015 will see Haverhill Market’s first Real Ale and Craft Beer Festival. There will be a great selection of regional, national and international brews along with delicious street foods served all day with an outdoor dining area and a live music stage to make this an irresistible offer. 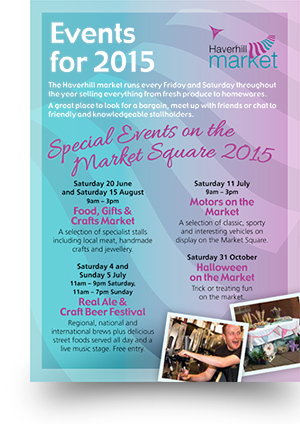 So get your drinking boots on and head along to Haverhill Market Square on Saturday 4th and Sunday 5th July. Festival runs from 11.00 a.m. until 9.00 p.m. on Saturday and from 11.00 until 19.00 on Sunday - free entry.